A shot inside the LHCb experimental hall at the Large Hadron Collider. 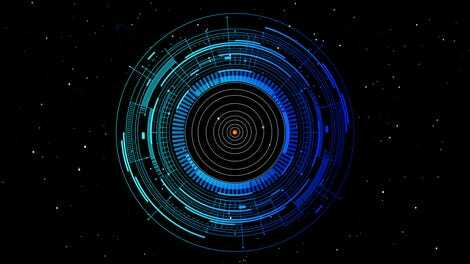 Scientists have announced the observation of “CP violation in a D0 meson” at CERN, a discovery that will appear in physics textbooks for years to come. You’re probably wondering what exactly it means. The Universe is full of regular matter. There’s also antimatter, which exists even here on Earth, but there’s much less of it. 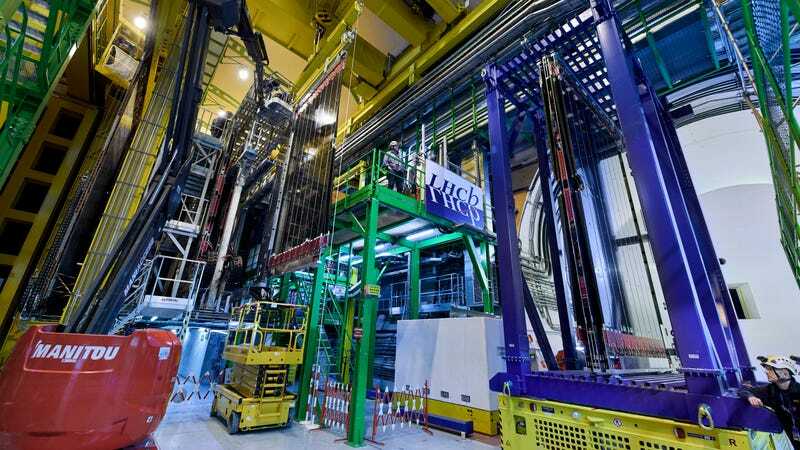 This new observation is important on its own, but it also takes physicists another step closer to explaining where all the antimatter has disappeared to. Understanding CP violation requires starting from the top, or rather, the charm. There are six kinds of quarks: the up, charm, and top quarks, which all have an electric charge of 2/3, and the down, strange, and bottom quarks, each with a charge of -1/3. Each quark has an antiquark partner with the same mass and the opposite charge (-2/3 instead of 2/3 and 1/3 instead of -1/3), and opposite parity, which you can think of as handedness. These particles combine into the protons and neutrons that create atoms as well as a variety of other particles, like the D0 meson, a particle composed of a charm quark and an anti-up quark. The laws of physics do differ if parity alone is switched, but should remain the same if the charge and handedness are switched—this is called CP symmetry, and it basically says that physics behaves the same when you switch a particle with a mirror-image of its antiparticle. But one quirk about antiparticles is that they annihilate when they meet their regular matter partner—and yet, there’s so much more matter than antimatter in the Universe. How did that happen? One potential explanation to explain why there’s so much extra matter is CP symmetry violation, or CP violation—examples where the laws of physics work differently if you replace a particle with another particle that has the opposite charge and handedness. CP violation was first spotted in kaons, particles that contain strange quarks, in 1964. It was a huge deal, and netted physicists James Cronin and Val Fitch the 1980 Nobel Prize. It was spotted again in the early 2000s in B-mesons, particles that contain bottom quarks. If you’re paying attention, both the bottom quark and the strange quark have a charge of -1/3. CP violation has never been observed in an quark with a charge of 2/3, even though it’s predicted to exist by the rules of particle physics, called the Standard Model. That is, it had never been observed until now. LHCb is an experiment that monitors collisions of high-energy protons at the Large Hadron Collider in Geneva, Switzerland. These protons travel at nearly the speed of light, and when they slam together, turn lots of that energy into particles that then decay inside the experiment. LHCb physicists reported today at the Moriond physics conference in Italy that their experiment measured an asymmetry in the rate that D0 mesons decayed into other particles compared to the rate that anti-D0 mesons decayed into other particles. It’s a big deal. “The talk by Federico Betti,” in which the result was announced, “was welcomed by a longer-than-usual applause, and after it the [conference] organizers (by surprise!) called the whole LHCb contingent at Moriond on the stage and offered two bottles of champagne,” Passaleva told Gizmodo. The team will continue measuring the amount of CP violation to see if it agrees with the amount predicted in the Standard Model, or if it differs—if it differs, it could be a sign of never-before-seen physical phenomena. But today, the LHCb team is celebrating.